Superstar Salman Khan has yet again introduced a fresh face to Bollywood. 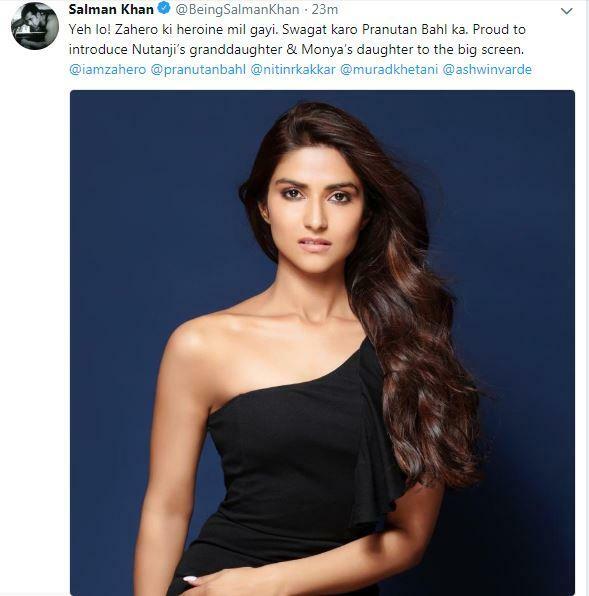 The 52-year-old on Monday formally made an announcement about Pranutan - the granddaughter of the legendary Nutan and Mohnish Bahl's daughter. She will star opposite newcomer Zaheer Iqbal, whose debut was announced by Salman earlier this year. The 'Race 3' star took to Twitter to reveal the news, writing, "Yeh lo! Zahero ki heroine mil gayi. Swagat karo Pranutan Bahl ka. Proud to introduce Nutanji's granddaughter & Monya's daughter to the big screen." Produced by Salman Khan Films, Murad Khetani and Ashwin Varde, the film will be directed by Nitin Kakkar. The shooting, which will take place entirely in Kashmir, is touted to begin later this month.